Skye Gravestones | St. Columba's Isle, Snizort. 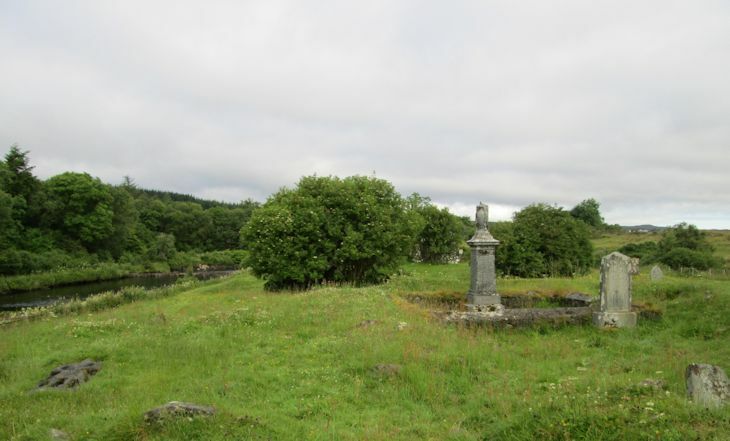 This small island in the River Snizort is an ancient and important religious site in the west of Scotland. In this beautiful spot, known as Eilean Chaluin Chille, the Island of Columba's Church, was the cathedral church of the Bishops of the Isles 1079-1498. It is just seaward of the road bridge across the river. Access is off the minor road to Tote & Crepigill from the main Portree-Dunvegan road. Apparently very few people visit this area which is a pity as it is very interesting with many knights, kings, and people of note buried here. Added by Ian McLean on 21 March 2018. I hope to visit there 6-9th August we are from New Zealand. My 3x great Grandfather lived and died 1874 at 50 Tote House he was 92, his name was Martin Martin wife I believe was Isabella daughter Janet Martin. What I really would like to know is if the house is still standing. Added by Sandra Havler on 01 July 2018. Suggest you contact the archives in Pprtree. According to the census, Martin Martin was a sizeable farmer rather than a crofter, so there's a good chance that his house would survive. Added by Roddie Macpherson on 02 July 2018.